Shanganagh Cliffs, Shankill - 10th June 2018. South Dublin members on the Shanganagh outing gather in Shankill DART station car park. Picture by Joe Hobbs. 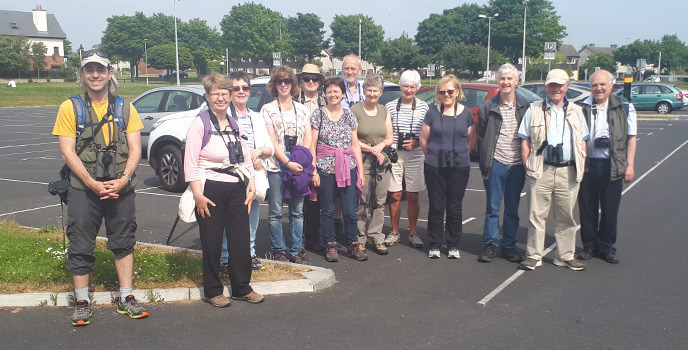 We enjoyed ice-cream weather during our annual outing to the Sand Martin colony at Shanganagh Cliffs, with clear blue skies, very little wind and balmy Mediterranean temperatures. About twenty South Dublin members met in Shankill DART station's car park at 10:30, and soon after we embarked on a circular route that took us down Corbawn Lane, north along Shankill Beach almost as far as Loughlinstown River before returning along the cliff path and through Rathsallagh to our starting point, about two and a half miles in total. We didn't enjoy a great start to the outing as there were no Sand Martins near the DART Station, and only a handful feeding around the concrete platform over the beach on our arrival there. This was both surprising and disappointing as you would expect this area to be thronged with them at this time of year. Regardless, and with great optimism that things would improve we made our way down to the beach and headed north. 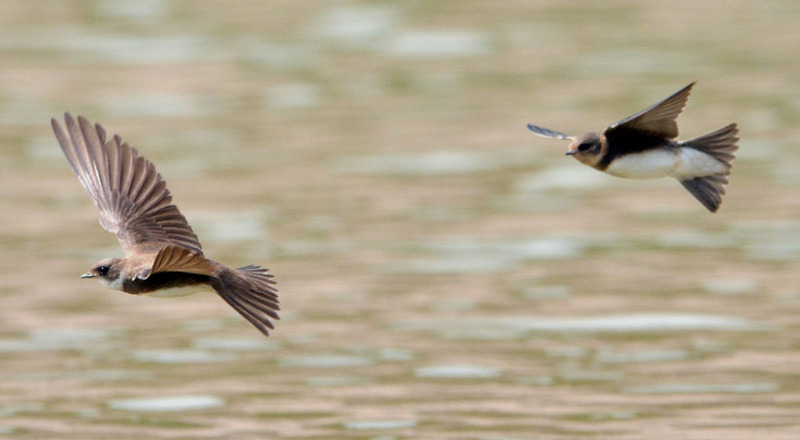 An excellent flight shot of two Sand Martins that were plunge diving at a quarry pond near Brinny, Cork. Picture by Richard T. Mills. As we made our way along, the apparent lack of numbers proved erroneous, and could be explained by the colony being less concentrated than before and we counted about six 'mini-colonies' spread out at intervals, with some occupying parts of the cliffs not previously in use. This change has probably come about as a consequence of cliff erosion and collapse that was evident in places? Consequently, birds were active along the entire length of the beach, continuously catching flying insects to take back to the youngsters still tucked up in their burrows. 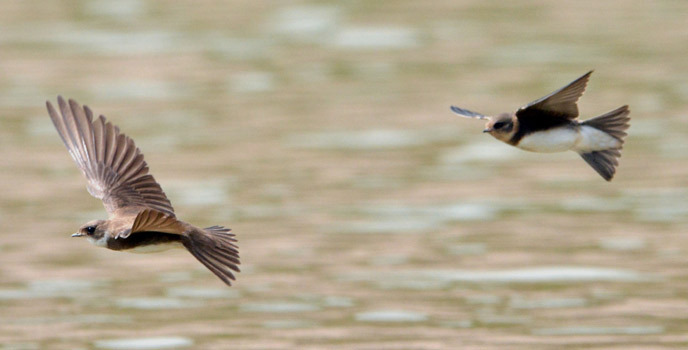 Collectively, swallows and martins are hirundines, a family of nearly 90 species worldwide. There is no real difference between swallows and martins, although those with a squarish (rather than a forked) tail are generally called martins. Sand Martin is one of six very similar species that have specialised in excavating their own nest burrows. It has a huge global range throughout much of Europe, Asia and North America. It is highly migratory, wintering well to the south of its breeding grounds in Africa, India, southeast Asia and South America. 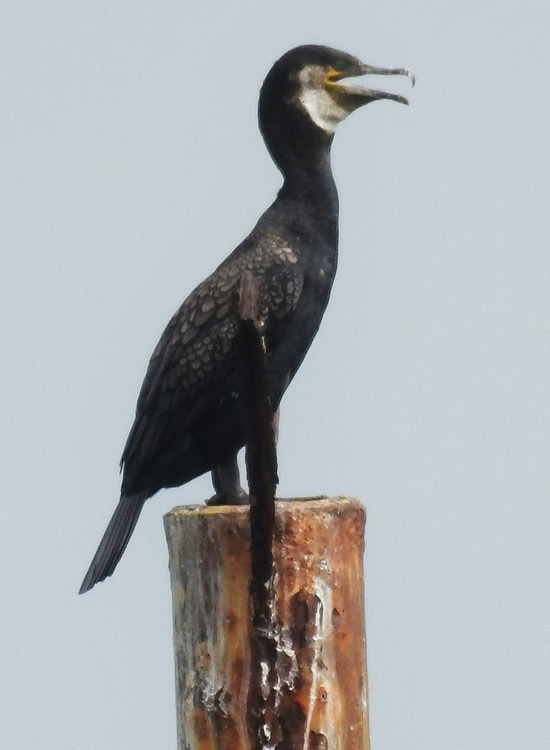 Cormorant feeling the heat. Picture by Gustavo Zoladz. Scanning out to sea produced very little and what was present was distant. Pat Twomey picked up a Guillemot that was spending some time on the surface preening and some of the time diving. A Grey Seal popped its head up for a look at us, but soon moved on. Gulls were all over the place, mainly Herring Gulls but a few Lesser Black-backs also. Two Black-headed Gulls still sporting their brown hoods flew over, perhaps birds that failed to breed elsewhere returning early? Rather disappointedly no terns were seen. 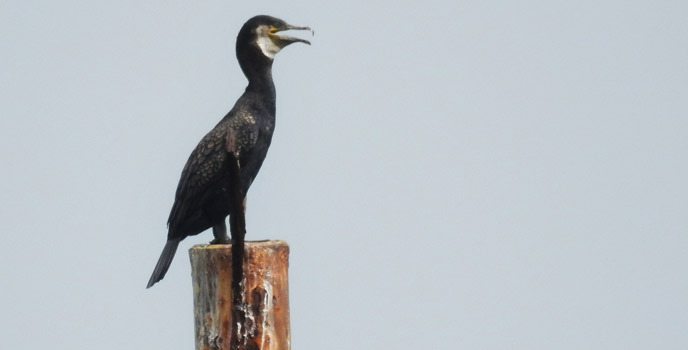 Reaching the halfway point we noticed a Cormorant perched on a wooden stake close to the shore. It was panting hard trying to keep cool in the hot sunshine. A pair of Collared Doves then flew past us heading towards the cliff path, and we followed after them and started on our way back. 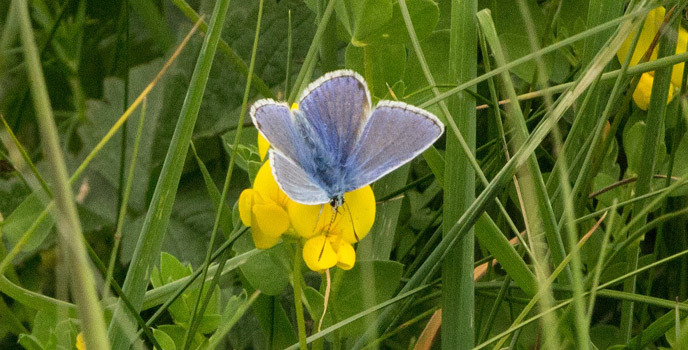 Common Blue butterfly feeding on Bird's-Foot-Trefoil on the cliff path at Shanganagh. Picture by Bill Rea. 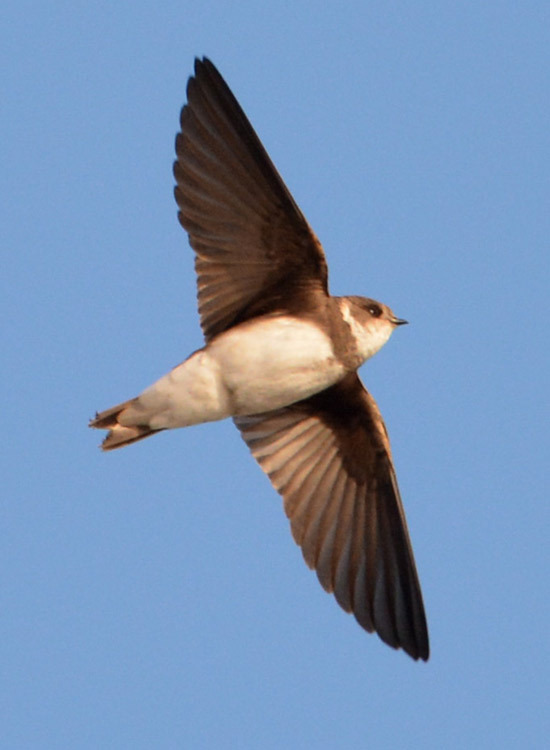 More Sand Martins were feeding along the cliff path and over the adjacent playing fields at Rathsallagh. Other species seen on this leg were House Sparrows, male and female Stonechat, Song Thrush, Dunnock, Robin including a fresh juvenile and the usual collection of corvids. 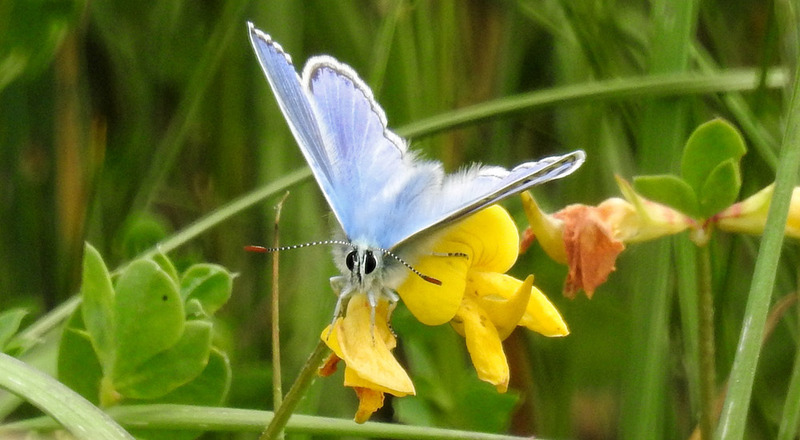 A Common Blue butterfly gave us great and close views as it fed in an area of Bird's-Foot-Trefoil. We had almost completed the circuit, but if anyone thought that was all for the day they were badly mistaken as Gustavo suddenly shouted out 'Buzzard'. Sure enough, high in the sky and off to the west was the unmistakable outline of a Buzzard slowly circling on hot-air thermals and we enjoyed intermittent views of it during the final part of the outing. 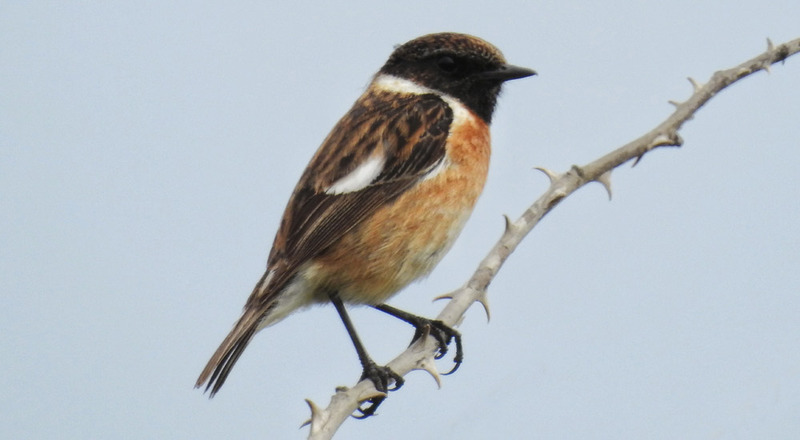 Male Stonechat on the Shanganagh cliff path. Picture by Gustavo Zoladz. Some more pictures taken on the day by Bill Rea, Gustavo Zoladz and Joe Hobbs, as well as some of Sand Martin taken elsewhere by Richard T. Mills and David O'Connor. 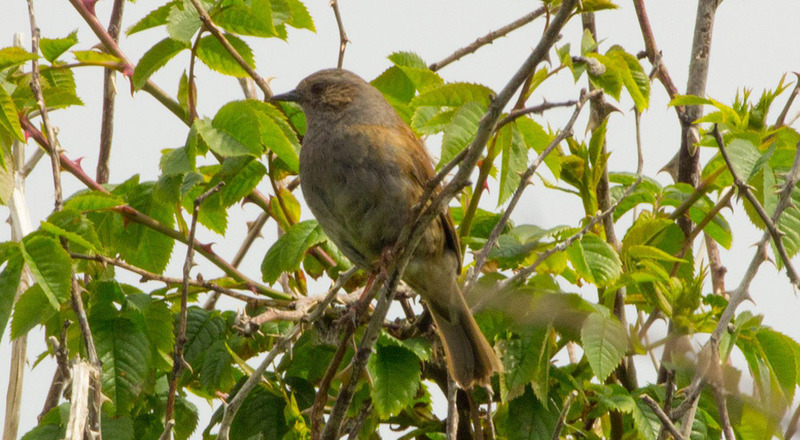 Dunnock in among the brambles at Shanganagh. Picture by Bill Rea. 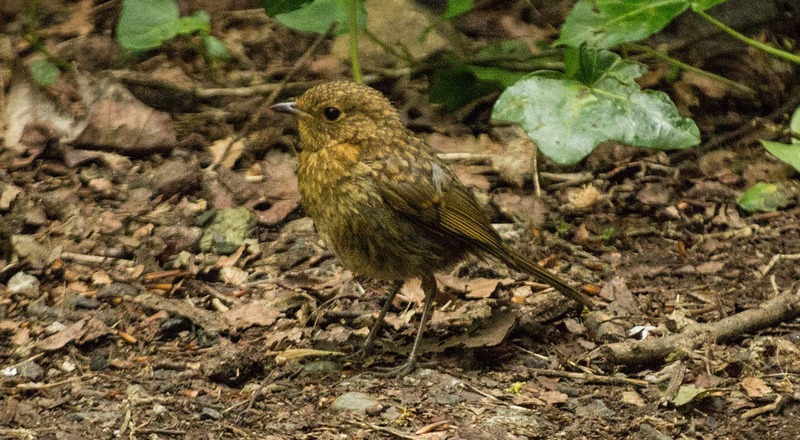 Juvenile Robin on the deck at Shanganagh. Picture by Bill Rea. 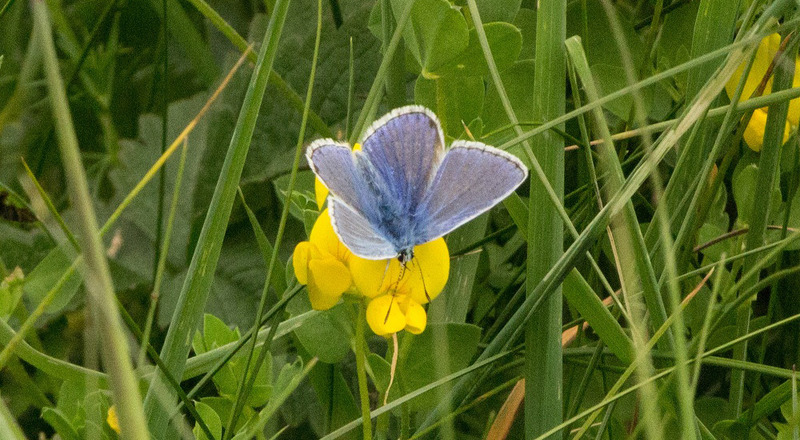 Common Blue butterfly. Picture by Gustavo Zoladz. 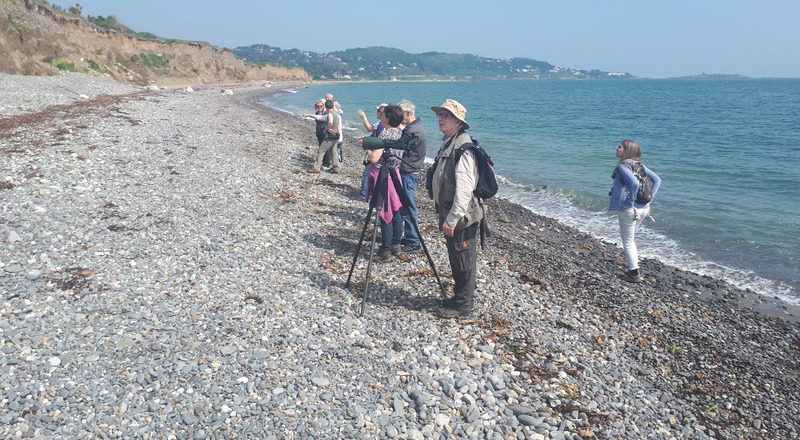 South Dublin members on stoney Shanganagh Beach with Killiney Hill and Dalkey Island in the background. Picture by Joe Hobbs. 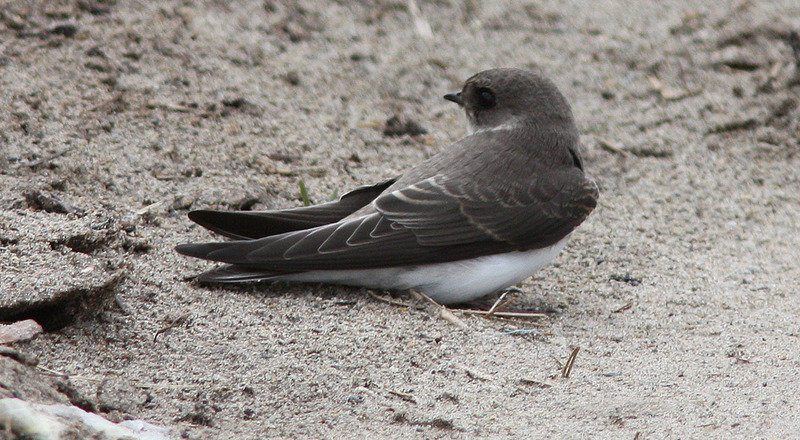 A juvenile Sand Martin on Black Rock Strand, Kerry, 26th June 2012. Picture by David O'Connor. Sand Martin at Bandon, Cork, 23rd April 2015. Picture by Richard T. Mills. 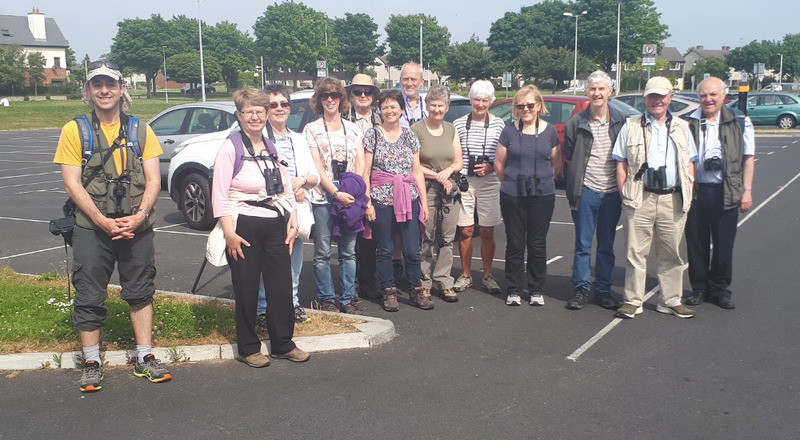 We arrived back at Shankill DART car park at half-past noon after a couple of hours of birding in beautiful weather under our belts. Branch Chairperson, Eleanor Keane made some announcements, thanked everyone for coming along and we all headed off home.